You're probably well aware that one of the hottest topics in enterprise mobility management right now is iOS 7. More specifically, you might also know that that iOS 7 is going to natively include mobile app management features that are currently strictly the province of third-party vendors. Since we’re going to be talking about this topic a lot—iOS 7 isn’t due for at least another month or two—I want to take some time to make sure we’re all on the same page about the different types of mobile app management (MAM) we’re talking about. App wrapping—you might think that since app wrapping is external MAM since it involves pre-existing apps, but since you have to have special access to the app itself (which is difficult or impossible with public app stores) and the resulting wrapped app has all the MAM features built in, it’s internal MAM. The disadvantage is that the apps have to be specially built (or modified) to have these MAM features. See articles about MAM standards, difficulties around acquiring MAM-capable apps, and difficulties distributing them. iOS 5 and 6—they do have some capabilities to deploy and manage corporate apps, it’s just that they’re not nearly as extensive as in iOS 7. Corporate app stores—sort of. While this isn’t a device thing, by controlling access to apps based on the identity of the user, a degree of control over apps is achieved. It can work with any app. All those concerns around app ecosystems, vendor lock-in, how to wrap apps, and so on are much less significant. The platform vendor (i.e. Apple in the case of iOS 7) can have special access to built in apps like the iOS mail app (and we know that email is a big sticking point with MAM). You’ll need to have some sort of control over the device to ensure that the MAM features are supported. So if you wanted to do MAM to get out of the business of managing devices, this might not work for you. This type of MAM is limited to whatever features happen to be enabled in the device, so if you want features that go beyond what’s in the OS, you’ll need a third-party MAM. App-level management (MAM in general) is becoming a very important part of enterprise mobility management. 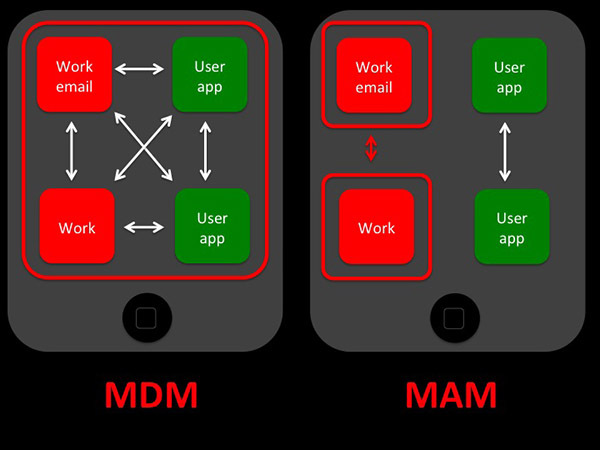 iOS 7’s MAM capabilities will be a big deal, but it’s important to keep in mind the differences between third-party and OS-enabled MAM. (And of course all of this is important for conversations around Samsung KNOX, mobile virtualization, and other platform-enabled MAM, too.) Clearly there are places for all types of MAM. Keep tuned for more on iOS 7 and MAM in general—there’s lots more to talk about! I think it's good to distinguish between the different types of MAM, but having "external MAM" refer to OS-delivered and "internal MAM" refer to 3rd-party delivered is a bit counter-intuitive and confusing. I think the important point is where the MAM capability is coming from -- the OS, or a 3rd-party -- not whether the MAM is applied during the development process or after compilation, or whether the policies are applied from within the app or external to it. Instead of "external" and "internal", I prefer "native MAM" to describe OS-delivered MAM capabilities, and "3rd-party MAM" to describe capabilities that are delivered by, well, 3rd-parties. This focuses us on the evolving dynamic between native MAM (or native containerization) and 3rd-party MAM, which is what I think is more interesting. As native MAM matures, it arguably chips away at the value proposition of 3rd-party MAM -- iOS 7 is an example of this evolving dynamic. I agree! "Internal" and "external" were a bit confusing, so I updated the article to remove them.